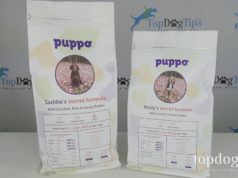 It is no secret that a homemade dog food diet can offer top quality nutrition when it is done properly. The reason that many veterinarians and canine nutrition experts won't recommend this diet is because most pet owners do not take the time to do it properly. With that said, this balanced homemade dog food recipe may offer the proper nutrition for some dogs, but it will not provide balanced nutrition for every canine. The term “balanced” is used by veterinarians, canine nutritionists, pet food companies and other experts in the field to refer to a diet that is nutritionally balanced and can be used as a dog's sole diet. The next time you're in the pet store, check out the label of the dog foods that are labeled “balanced.” They specifically state the type of dog that the food is formulated for. For example, food for puppies, senior dogs, dogs in all life stages, overweight dogs, dogs with special health conditions…the list goes on and on. So, now you can see what I mean when I say that this balanced homemade dog food recipe is not going to be suitable for every dog. Before you begin feeding this food, discuss the change in diet with your vet or a trained dog nutritionist. They will be able to tell you if this food will provide adequate nutrition for your pet. It's likely that the expert you consult will recommend adding supplements to this recipe. In fact, a recent study performed on 200 homemade dog food recipes showed that many recipes (even the ones that come from veterinarians) do not have all the adequate nutrients that a dog needs. As you can see, this balanced homemade dog food recipe looks like a chicken stew for dogs. It's very easy to make, because it's prepared in the slow cooker. Begin by adding the chicken, livers, carrots, green beans, apples and olive oil to the slow cooker. Put the lid on and cook on low for 6-8 hours. You'll know when it's finished, because the chicken will be very tender. When the recipe is done cooking, add the peas and parsley and stir until it's thoroughly combined. Let the recipe cook for another 10-15 on low. Once it's cooled you can serve it to your dog. Store the leftovers in an airtight container in the refrigerator for 5-7 days. You can also freeze the leftovers in an airtight container for up to 3 months.